The Soyuz TMA-17 spacecraft lands with Russian cosmonaut Oleg Kotov, NASA astronaut T.J. Creamer, and Japanese astronaut Soichi Noguchi near the town of Zhezkazgan, Kazakhstan on Wednesday, June 2, 2010. A new video of the recent landing of a Russian Soyuzspacecraft shows the touchdown on the Central Asian steppes of Kazakhstan froma rare ground-based view of the space capsule's jarring touchdown. A camera mounted on a Russian Search and Recoveryall-terrain vehicle captured a uniquevideo perspective of the Soyuz TMA-17 spacecraft carrying the InternationalSpace Station's Expedition 23 crew on June 2. The capsule toucheddown with the help of parachutes and thrusters east of the town Dzezhgazkanon the steppes of Kazakhstan. The videoshows the parachute's deployment and the cloud of dirt that the spacecraftkicks up as it hits the ground with a jolt. 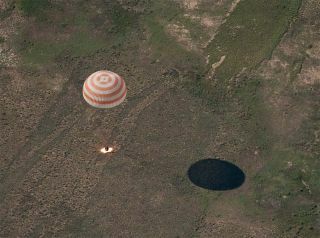 Recovery crews can be seenscrambling to open up the capsule and retrieve the three spaceflyers inside.All-in-all, it was a standard and uneventful landing, according to NASA andRussia's Federal Space Agency. Russian cosmonaut Oleg Kotov, American astronaut Timothy"T.J." Creamer of NASA, and Japanese astronaut Soichi Noguchi, returnedto Earth on the Soyuz after 163 days in space. Their landing cleared the wayfor a new crew to launch this week. That new cadre of astronauts? Expedition 24 flight engineers Doug Wheelock and Shannon Walker of NASA andFyodor Yurchikhin of the Russian Federal Space Agency ? are due to launch Tuesdayat 5:35 p.m. EDT (2135 GMT) aboard the Soyuz TMA-19 spacecraft from BaikonurCosmodrome in Kazakhstan. The trio will take up residence on the station aslong-term crewmembers.